Wood fence cleaning is best done with a power washer, but you only need to do it once every three to five years! The required maintenance for your fence all depends on the type of material it is constructed with. Fence maintenance does not have to be a daunting task, and it is fairly simple to clean all types of fences. 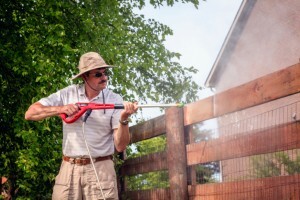 Mid-Atlantic Deck and Fence is here with a few quick and helpful fence cleaning tips for different types of fences. Cleaning your vinyl fence is simple! The best way to clean your vinyl fence is with a water hose, vinyl-specific cleaning solution (or soapy water) and a soft scrub brush (for challenging stains and debris). It is only necessary to clean your vinyl fence every three to six months. Vinyl-specific cleaning solutions will always be labeled as environmentally friendly. The main reason you need to clean a vinyl fence would be to wash away dirt, grass, and other debris associated with inclement weather. Cleaning a wood fence works a little differently. To clean and stain your wood fence, it will require a power washer, wood staining product (don’t use paint! ), bleach, wood specific cleaning solution and a plastic sheet or tarp. The tarp is to protect the grass surrounding your fence from damage. You should clean your wood fence once every three to five years. Talk about durability! Apply your cleaning solution to your wood fence and let it soak until your fence appears brighter and cleaner. Next, spray your fence off with water using a power washer to clear debris and remove stains. To clean a chain link, steel or aluminum fence it will require a hose, soft scrub brush and soapy water. Like vinyl fence cleaning, the scrub brush is used to remove challenging stains and debris and the water from the hose is used to wash this debris away. These durable fences only require cleaning one time annually.